Spring is in the air, and I’ve suddenly stopped knitting. I’m not sure why – maybe it is a sign that the current project isn’t working out as I hoped. Hopefully, it isn’t permanent – it has only been three days. In a strange coincidence, I’ve also started having trouble sleeping. Maybe it is the knitting in the evenings that is making me go to sleep so easily. Mummy, that’s too much wool. I don’t like it. Tough. I’m wearing it anyway. Slightly weird shot taken in the mirror. I note that he was only copying his Father, who questioned the need to wear Elektra with the new cardigan. They are both on my list. For the first time since last July, I had no socks on the needles, and not even a second sock to do. This state of affairs began at the end of February and continued until yesterday. Of course, there was a scarf being made with sock-weight yarn, but it didn’t have the portability of a sock. This sad situation has now been remedied. I’m using the March yarn from the Sock Club I am in: When Granny Weatherwax Knits Socks from The Knitting Goddess. The yarn and pattern are both inspired by Terry Pratchett’s book Equal Rites. The yarn is pale blue, with flashes of red and yellow. The pattern (Eskarina) looks nice enough, but I have a hankering to learn a new sock construction. The sock construction I am using is Cat Bordhi’s Sweet Tomato (I have to remind myself to say Tom-may-to rather than Tom-mar-to) Heel. I love the sweeping curl of the Coriolis design she uses. 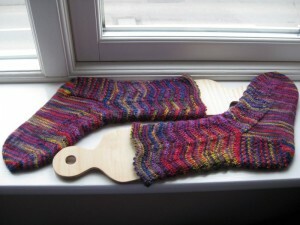 I’ve knitted the version from New Pathways for my sister and the Sweet Tomato Heel version was released last week. So, there we have it. I could just knit the Sweet Tomato Heel Coriolis, but I want to give at least a mention in the socks to the Eskarina pattern. In the New Pathways Coriolis, Cat mentions that you can widen the coriolis band – let’s hope the same applies to the Sweet Tomato version! I’m going to attempt to widen it enough to fit one repeat of the Eskarina lace pattern in it. It will take a bit of working out, but I have confidence that it can be done. I’ll start the Coriolis band a bit further up the foot to ensure that it will be in the correct place to avoid the heel. 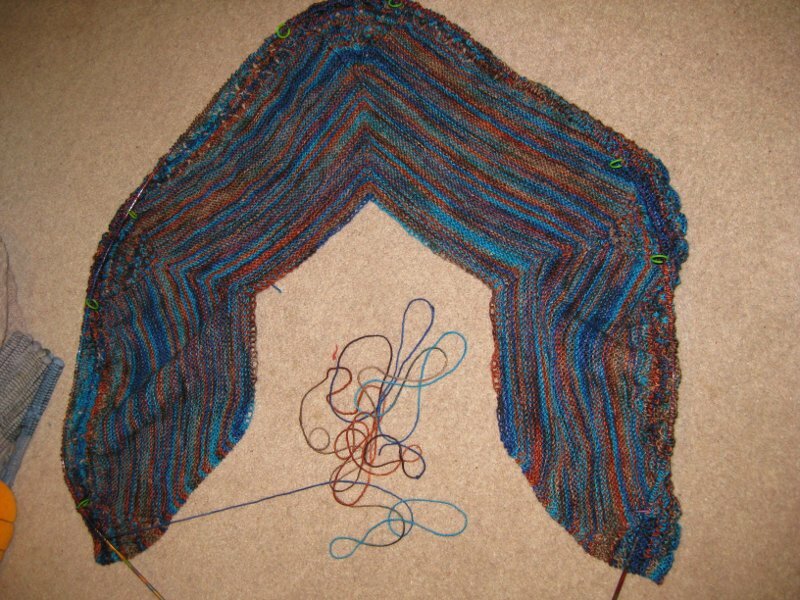 So far, I have three inches of toe, working two at a time on two circs. Pictures in due course, when something interesting happens. I think we’ve all seen sock toes before. Since I last posted, I have mostly been knitting away on Elektra, which is now completed and sitting on the blocking board. 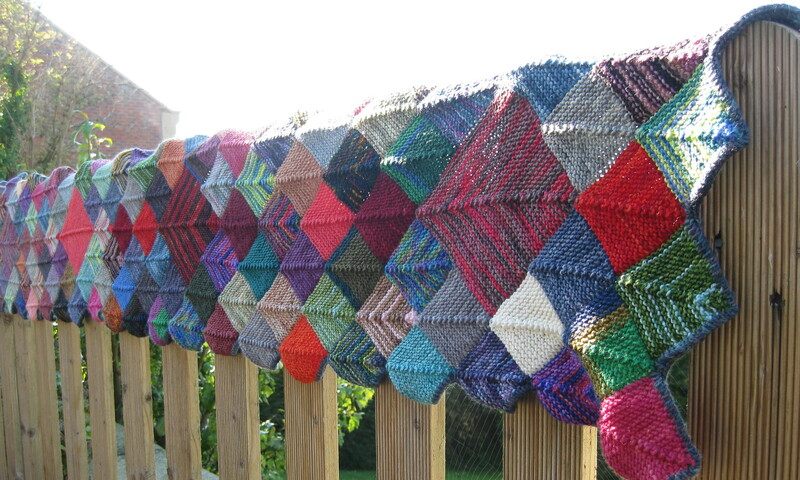 The pattern starts with a cast-on of just over 100 stitches, increasing to a total of around 450 per row by the end. The yardage in the pattern was slightly more than in the skein I was using, and there was an option of doing one less repeat of chart B if there was any doubt of whether the yarn would be enough. 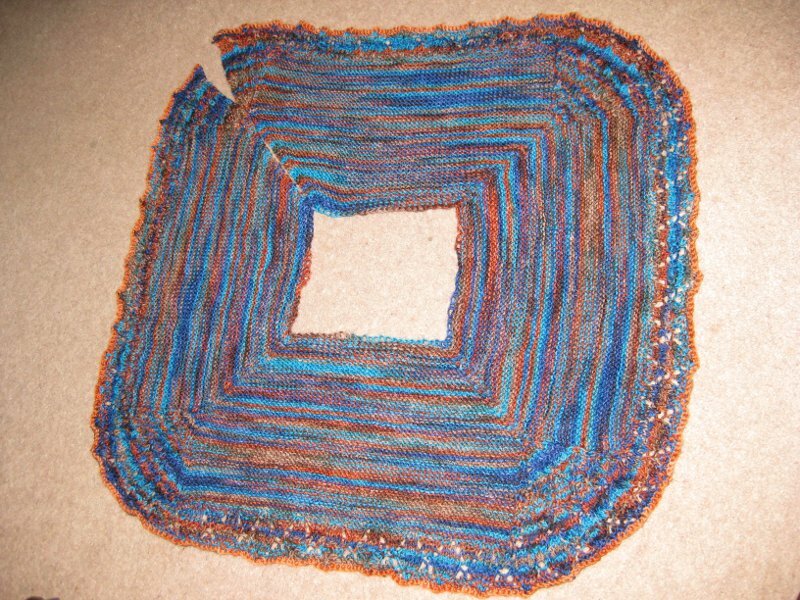 The question became how to decide whether there would be enough yarn, since the decision needed to be made quite near the beginning of the pattern. I put together a spreadsheet with the stitch count for each row and worked out that at the point of decision I needed 72.76% of the yarn left to do the full number of repeats or 68.65% to do one repeat less. I knew the yarn was around 100g (probably a bit more, but I didn’t weigh it to begin with) and I had 78g left at that point – looked promising, so I did the extra repeat. 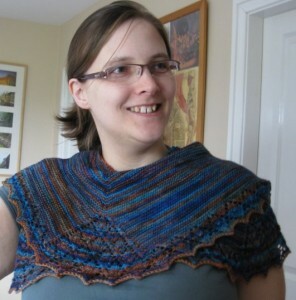 The pattern was a real pleasure to knit – mostly garter stitch, but with enough lace sections in the main part to make it interesting, then a lace border. 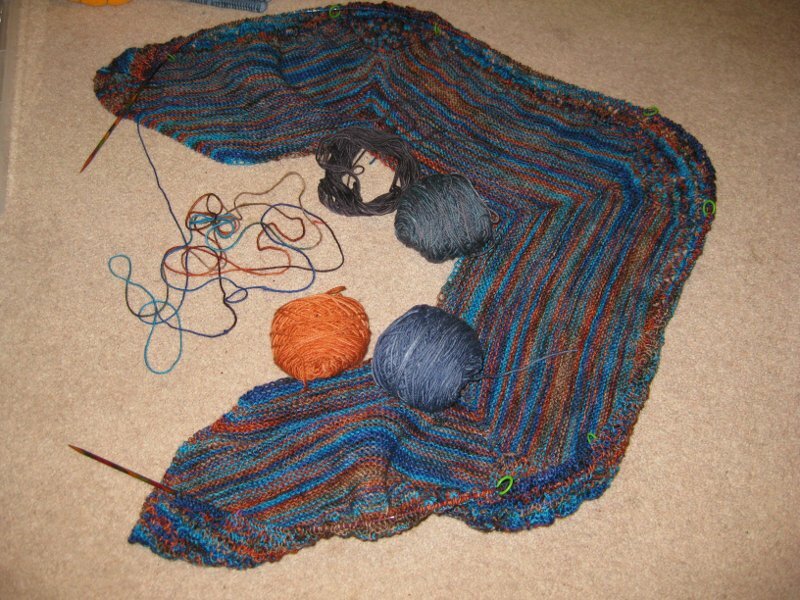 With four rows to go, it was looking a bit touch and go as to whether there would be enough yarn. There wasn’t. Despite all the calculations, there were only 2 yards left when I got to the bind-off row, so I ended up with a contrast bind-off. I would have liked blue, but didn’t have quite the right one. The orange looked just fine. Weigh the yarn before the start of the project. 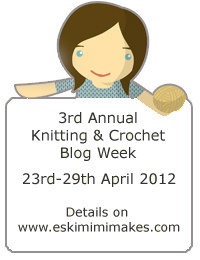 One of the things that really interests me about knitting is ergonomics. 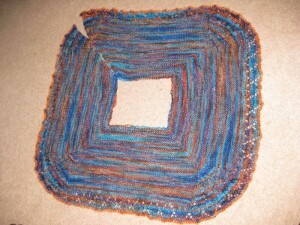 How can I knit more comfortably and more quickly? How can I put the effort in now to protect my hands against future degeneration/arthritis/RSI/whatever else can go wrong?